Nancy and Intern LCogs are helping cover Spring '13 New York Fashion Week. Below, Nancy writes about the Degen presentation, while LCogs lends her photography skills. 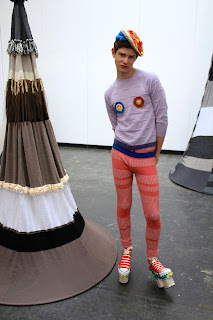 Going to the Degen Spring / Summer 2013 Presentation at Industria Super Studio, we knew Lindsey Degen was well versed in knit wear; and that is exactly what she delivered. We learned that she first started knitting at age 3, when her grandmother gave her a pair of knitting needles and taught her how to stitch. The Degen line defines fun, quirkiness, and color. While most pieces are not intended for the mainstream fashion population, I would definitely love to incorporate something Degen into my Spring wardrobe. Some of our favorite pieces were the crocheted bikini top, knit pants (they looked super comfortable!) and her simple t-shirt "The Shizz Knit" (get it?). Her Converse collaboration, while I would never dare wear it, added an extra element of drama to her presentation. They were bedazzled, platformed, and tie-dyed. I adored the styling of her line with whimsical crocheted headpieces, and glittered lips and brows.